Nail care at home ensures proper nails health. About all of us usually consider their nails to be not so important to be regularly taken care of. But, just like other parts and body skin, nails also breaks, dries out, or break and gets infected sometimes. 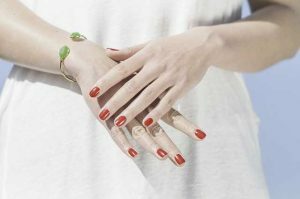 So, we should take care of them as beautiful and healthy nails represent healthy skin and add to your personality. You can use your favorite toothpaste for Nail Care At Home. Take some toothpaste and scrub your nails, using that paste, for some time. Scrubbing will remove all the strains and dirt marks from the nails and will bring shine on them and is great for natural nail care. Take a lemon slice and rub it over your nails for some time Or extract the lemon juice from lemon and add it to water in a container. Soak your hands in the lime water with nails completely dipped in it. Lemon removes the strains or dirt and so lemon is great for Nail Care at Home. Clean your nails properly by removing old nail polish from your nails using a nail polish remover. Take a teaspoon of baking powder and add 1 teaspoon of lemon juice to it. Mix them properly to make a paste. Put some of this paste on each nail of your hands. Buff your nails gently using a buffer for some time. Wash your hands and nails properly. This is great for nail care at home and will help reduce yellowness of your nails. Take some barley powder and add some lemon juice to it. Mix them well and apply this mixture on the nails joints of blue nails. This can be done twice in a month and will clear the blue spots from nails. Take some olive oil in a container and keep it in microwave for about 30 seconds to get it just little warm. Take it out and dip your nails in this oil. Keep your nails dipped for about 10 minutes. Take out your hands out and massage your skin and nails for some time. This will make your nails shine and your skin healthy. Take some heena powder and add some water to it and mix properly to make paste. Apply this paste over your nails and let it dry. Wash off with cold water and soak using soft towel. This will give natural pink color to your nails. For natural nail care at home, take some warm water and soak your nails in it. Dry them out and moisturize your hands and nails with a moisturizer containing vitamin E and collagen. This will keep your skin and nails hydrated and healthy. After applying moisturizer, push your cuticles back gently and avoid cutting them. Manicure is good for nails unless it is done occasionally. Best time to manicure is immediately after bath or washing dishes or shower as all the under nail dirt is removed in the process and also nails gets soften. Some common nail care tips include :- Avoid nail biting or keep them out of your mouth as it can damage nails as well as cuticles which will lead to deformation of their shape. It can also cause infections in nails and skin. If your nails are too soft and you want them to harden a bit :- Take some olive oil and keep it in microwave for half a minute just to make it warm. Soak your hands for about 15 – 20 minutes in this oil. This will give hardness to your nails and this process can be done for about 3 times in a week. If you notice a problem in your nails that you think is not a common one or if a common problem persists for a long time even after nail care at home, consult your dermatologist for same.